Over a remote northern forest, a small plane carrying five teenage friends flies into a freak storm. Struck by lightning, the aircraft crashes and the passengers find themselves cast into a life-changing adventure. In a hidden valley, a mysterious people gaze at the stormy sky as a glowing object with fiery wings disappears behind a mountain ridge. The astonishing sight reignites an ancient prophecy foretelling the arrival of five chosen ones destined to become bearers of light against a dark storm gathering on humanity's horizon. In a distant city, a secretive organization led by a shadowy figure initiates a sequence of cataclysmic events designed to wreak havoc across the planet, beginning with a remote mining site in a northern Canada. As the three worlds collide, unlikely heroes arise. Armed with powers entrusted to them by the ancient prophecy and the resilience of their life-long bond, the five teens take a stand against a malevolent foe. "My name is S.S. Segran and I’m so excited to be sending you this letter it is a long time coming. I am putting together my first official book tour this is not a review tour more of an introduction of me and my book." Hello, run-ons. All of us here at Best Books Ever groaned a little bit when we got the email. Really, it read like a very informal letter from one of my students. I thought, well, the whole book might be like this, and maybe she would benefit from some constructive criticism. I am so pleased to tell you that I was dead wrong. The book is very professionally written, to the point where sometimes I was wondering if the author had a ghost writer. I decided that either she has an amazing editor, or is clear on the difference between formal and information communication. I really enjoyed the story because I felt like the angle was unique. I have not really heard of something like this before, and I am so glad that Ms. Segran had the motivation and ability to capture her ideas on paper. I am extremely impressed not only with the quality of the writing, but the creativity of thought and development of plot. If you did not know she was so young, you would never have guessed it. Frankly, this is way better than a lot of stuff I have read by adult authors. 1. The 5 teens go down in a plane, that much is obvious from the blurb above, but the person flying the aircraft was a father of one of the teens, and they do not know what happened to him after the crash. Quite frankly, there is nothing that could keep me from finding my dad if I did not know if he was alive or dead. I felt like maybe not enough angst was giving to this particular teenager, who is in the middle of nowhere without knowing the status of his dad. But that might just be a testament to the author writing this at such a young age... you know, the age where everyone is super self-centered anyway. 2. I felt like the malevolent foe was obvious. No, I am not going to give it away, because the author spends quite a bit of time building this plot point from the perspective of the mysterious society as well as from the Big Bad's point of view. I am chalking this up to being a Biology teacher, because it just seemed clear from the beginning to me. Now all that being said, I have no idea where the story is going in the future, because not much detail is given about what exactly is being mined and for what purpose. I think it is going in a good direction, and one that is probably more "mystical" than what ended up being the case here. 3. On the subject of the malevolent foe, he/they were only brought into the picture in the third section of the book, which felt rather abrupt. So much time was given to them in that third section, I felt like it distracted from the story I really wanted to hear about - what was going on with the teens. Overall, it is really clear that Ms. Segran has a LOT of plans for this story and she spends a lot of time building. I am definitely looking forward to the next installation. I highly recommend you read this book! Shirin started experimenting with writing when she was very young. Her mom and I remember how she would write extensions to the final chapters of books that she was reading because she didn’t want them to come to an end! This was probably when she was in pre-school and grade school. From there she attempted writing many short stories through grade school to middle school. The basic concept for what eventually became Aegis Rising began when she was fourteen or so. After three years, the book was finally published in November of last year. 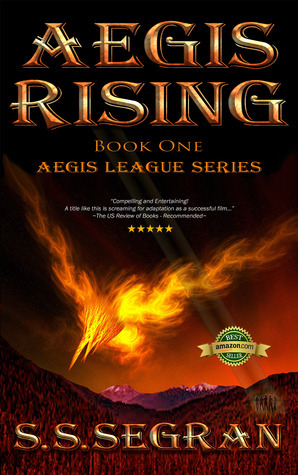 Last week Aegis Rising made it to Amazon’s Bestseller list in its Kindle Store in a Sci-Fi sub-category. She is currently working on Book Two of the series. She has finished 8 chapters so far and plans to complete and have the book published in November this year. OH MY GOODNESS! So, I have to add in here that I spoke with the author and with her dad about the wonky email that I got introducing the novel. As it turns out, Shirin did NOT write that. They had hired a consultant, and the consultant decided to email bloggers as Shirin instead of contacting them for Shirin. And, as you can see above, the consultant has less-than-stellar grammar skills! Mystery solved, folks. In other news, we will be putting together a blog tour for this book. If you want to learn more about the author and the book, you can watch this quick tv interview HERE.